The Acctivate Software License agreement is a legal agreement between Alterity, Inc. and companies using the Acctivate software. The license agreement is available during the installation of the software or you can view the current version of the license here. Features and functionality in the Acctivate software are governed by the license agreement. You can view the current License Information directly from the Help menu in Acctivate. This includes the list of modules and the number of current and total available users. The licensed modules and total available users are updated daily. 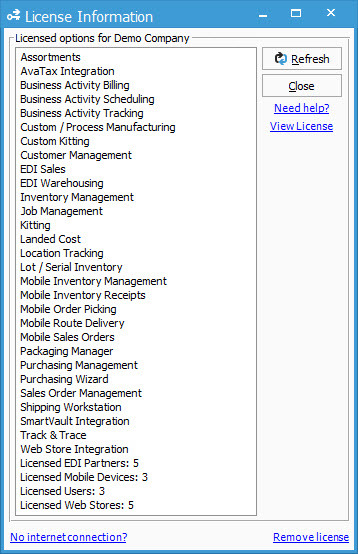 Click Refresh to contact the Acctivate license server to check for newly purchased modules and users. Remove License will restrict use of Acctivate on this server. It is unnecessary when transferring a license to a new server. Simply register Acctivate on the new server and the old server will be automatically de-activated the next time it runs. The link for No internet connection? should only be used to obtain a new license in the event that the Acctivate license server cannot be contacted from your computer. Please try registering Acctivate on another workstation computer before you use this method.